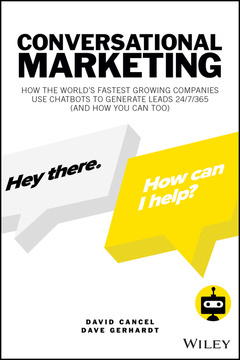 Conversational Marketing is the definitive guide to generating better leads and closing more sales. Traditional sales and marketing methods have failed to keep pace with the way modern, internet-savvy consumers purchase goods and services. Modern messaging apps, which allow for real-time conversations and instant feedback, have transformed the way we interact in our personal and professional lives, yet most businesses still rely on 20th century technology to communicate with 21st century customers. Online forms, email inquiries, and follow-up sales calls don’t provide the immediacy that modern consumers expect. Conversational marketing and sales are part of a new methodology centered around real-time, one-on-one conversations with customers via chatbots and messaging. By allowing your business to communicate with customers in real time—when it’s most convenient for them—conversational marketing improves the customer experience, generates more leads, and helps you convert more leads into customers. Face-to-face meetings, phone calls, and email exchanges remain important to customer relations, but adding a layer of immediate, individual conversation drives the customer experience—and sales—sky-high. DAVID CANCEL is the co-founder and CEO of Drift, the world's leading conversational marketing and sales platform, named to the Forbes Cloud 100, LinkedIn's Top 50 Startups, and Entrepreneur's Top Company Cultures. Cancel is also a serial entrepreneur, podcast host (Seeking Wisdom), angel investor, and advisor. Cancel has been featured by media outlets including The New York Times, Forbes, Fortune, Wired, and Fast Company, and has guest lectured on entrepreneurship at Harvard, Harvard Business School, MIT, MIT's Sloan School of Management, and Bentley. In 2017, Harvard Business School named Cancel an Entrepreneur in Residence at the School's Arthur Rock Center for Entrepreneurship. Cancel's blog davidcancel.com has been read by more than a million entrepreneurs, while his Twitter account @dcancel has more than 60 thousand followers and is considered a "must-follow" for entrepreneurs and executives. DAVE GERHARDT is VP of Marketing at Drift and a passionate advocate of building brands around compelling stories that connect with customers. Since joining Drift in 2015 as employee #6, Dave has helped to create the category of conversational marketing and get 150,000+ businesses onboard with Drift, and Drift has been profiled in more than 100 publications, including The New York Times, Forbes, Fortune, TechCrunch and the Harvard Business Review. Before joining Drift, Dave worked at some of the fastest-growing SaaS and B2B marketing companies in the Greater Boston Area, including HubSpot and Constant Contact.